When a child reaches into the box of markers for the blue marker, takes the blue cap off the marker, and starts coloring, you know what they’re expecting? Yeah, they’re expecting to be coloring in blue. Not purple or green or black or red. And you know what it sounds like when a student discovers that the marker they thought was blue turns out to be green? Well, I can tell you one thing, it doesn’t sound like a happy art student. So I ask you again, Crayola®, why would you do this? I mean, what Kindergartner is going to take the time to test the color of the marker before using it? Well, as it turns out, it’s the Kindergartner whose marker caps were on the wrong color marker three times in a row. But that’s besides the point. Take a close look at what you’ve designed. 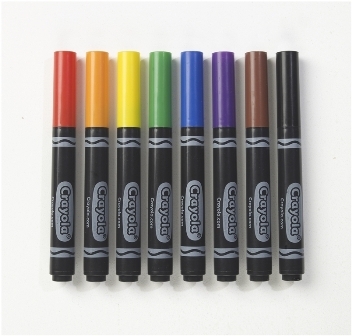 ALL black markers in which the only indicator of color is the removable cap? * Really, Crayola®, really? Wasn’t there a better “green” solution being tossed around during your brain storming sessions? You guys came up with Model Magic® for crying out loud. And Color Wonder®. Did you even think to ask any teachers what they thought? Because I guarantee you they’d spot the flaw in your design instantly. I suggest you head back to the drawing board. Pun intended. * Yes, I realize the tip of the marker can indicate color, but again, that approach is flawed. Red and orange look an awfully lot alike, and how can one expect eager, excited students who rarely ever get to use markers to take the time to study the tip prior to coloring? But you get that, right? Of course you do. I 100% agree with you. I have had the same problem with these markers. haha I knew what this was about before even reading it!!! It does say the color on the side, but ya just plain dumb in general… In my opinion markers are dumb! They are so expensive and get wasted so easily.. Yes, very bad idea. I would also put washable crayons and all color wonder products in their bad idea category. I just got my new ones yesterday. I didn't even think about it until you posted this. I sure hope you send Crayola this message, you totally should. I hadn't seen these yet, but YUCK. They should at least have a color stripe around them. I mean, even if the color name is there, it presumes the kid can READ. A few years ago I got a big box of Crayola markers that included some “tiger orange” (which was more like a yellow-orangey brown). The caps were orange colored and the kids were shocked that the color that came out was not bright Crayola Orange. You couldn't tell the color until you used it. OMG! I agree with all of the comments! Many of the colors are dark & you can't tell one from another by just looking at the tips without testing them. I'm so tired of having a kid yell out 'I thought it was green!' No kid is going to 'read' the side of the marker when they're diving head-long into coloring…that's if they CAN read! Re-create, re-design Crayola, PLEASE! Maybe you could use colored electrical tape and put a little stripe on them, just so you can be sane until they run out. I was making the same comments about the markers in the staff lunchroom one day – and many other teachers said they didn't even notice the problem. they saw that the markers were now black, but didn't realize that would be such a problem. How is the world going to function if funding for art programs is diminished. People won't notice if the White House gets painted! What about the new Elmer's glue bottles? The entire cap is now orange, so I can't teach kindergarteners who have never used real glue before to “twist the orange part” of the cap to open it…. I may be keeping my old glue bottles forever! I've had the exact same problem, only with 6th graders who mix them up on purpose. Does not make for a happy teacher. oh goodness…I hope you have sent a note to crayola…(we should all do it!) those boneheads need to know how they are affecting our classrooms. My budget was so low this year I didn't even buy them. Thanks for the heads up…how frustrating. I mean I don't even look at the names on the side and I CAN read! OMG… I haven't gotten new markers but this is awful! I will not be getting Crayola if it causes this much of an issue. I do NOT have time to check if the kids put the caps on the correct marker! Oh brother Crayola! Let's get some art teachers on your design committee! See how art is sooooo important for ALL kids to have?!!! So all of the markers we order are designed like this for next year? Is that a stupid question I guess I could call SAX. . . but do you know? I am so with you on this!!!! My students have had the same experience this year and it is VERY frustrating! Crayola has made so many amazing products, but this one was a huge miss!!!!! I haven't seen these yet and hopefully I won't! My students have a difficult time accepting the colors in the construction paper box, so this would really blow them away. The red in the construction colors looks pink until you use it on paper…K has to have proof:) before they believe me on that one. When I try different brands I always go back to Crayola, but if this is all they have to offer this year, I'll move on. I don't have enough time and patience to deal with this with my K-2. I agree 100%, have disliked them since I unpacked them in September. Some of my older children have the patience to try to figure it out when caps get mixed up, but the rest….Love Crayola, but this was just a bad idea! I only use the Mr. Sketch markers nowdays. They are more expensive but they last a lot longer and the kids actually seem more motivated to draw with the scented ones. I got so annoyed with the “Tiger Orange” and the “Royal Purple” in the classpacks. Hello, those don't count as two extra colors. Boo. I ended up putting all those in my free draw box and now the kids know Mr. Sketch are only for projects. Funny and correct! What kid (in any grade) takes the time to read the dumb marker side! BAD DESIGN. Turn this into a “design project” and explain good design vs. bad design. You now have a great BAD example! I also find that if a manufacturer starts making a product with a new design, fights also ensue between the students to use the “special” new supply (or color, or handle, or apron, etc). In other words, the marker bin had better be ALL old markers or ALL new markers or bloodshed may occur. Never mix. I just emailed a nasty letter to crayola. You guys should too. I mean seriously! Get it together Crayola! For the love of God! We greatly value consumer input like yours, and in response, are now introducing our 2nd generation recycled marker with a white barrel and colored graphics, for ease in matching the color with the cap. Recycled material will continue to be used to manufacture the black end plugs. Depending on store inventory, you could begin to find the white barrel markers on store shelves starting Spring 2011. Additionally, in Spring 2011, we will expand our solar farm allowing a half-billion Crayola markers made in the USA to be produced using power from the sun! I sent a note to Crayola and will not be buying any black barreled markers for my class this year. Very frustrating last year. Hahahaha! This is hilarious!! Thought I was the only one that had these issues. I;ve even contacted them… SO DUMB. I know right! My children are in 4K (4 year old kindergarten) and they have those wooden marker holders where the caps fit into these predrilled holes and the kids can just pull the marker out to use it and then presumably match the marker back to the corresponding cap-click in place. Easy right? Yeah not anymore! My children's teacher ended up sending all the markers back and ordered from another company! Crayola lost money over this dumb idea! My kids hate these markers, too. Their parents bought them at the beginning of the year, and I'm sure they thought they were doing a good thing. No little kid is going to take the time to read the label, especially when it is TINY! They should have left the color band on. kindergarten students often cannot read…….. I have the same problem with my kids (Pre-k through 6). Kindergartners don't read. Mr. Sketch “smelly markers”!!!! They get it! I knew the story before I started reading…..ticks me off to NO END! Do they have no common sense/logic at Crayola? That’s some crappy design. This is a product used by children. Duh. And me too. I want easy. Here’s another issue I have with Crayola markers. The design of their caps is poor. They fall off too easily. Mr. Sketch’s caps are much more secure. I prefer Crayola art supplies over most all others, but not in the area of markers. Hmm. Looks like I am commenting on a post from 5 years ago! Wow. Happy to see in other comments that Crayola fixed the problem.